Most physicians first experience with treatment setting mismatches occur when they are medical students and residents. The ethos of medical training fosters an attitude of being put upon by the trainees - partly because they are or at least they were. There was a history in American medicine as using the trainees in particular as inexpensive labor - doing all of the admissions to training hospitals and staffing them all night long. In many if not most cases that meant long hours and minimal staff supervision. The staff typically would hear about late night admissions only if they gave their resident team specific parameters to call them. That work flow created tension in the system of care. Depending on the institution teams could negotiate for admissions but typical the emergency department (ED) physicians had veto power in getting people in the hospital. They were in the highest risk situation because they were responsible for what happened with discharges from the ED and they were responsible for getting patients out of the ED in a timely manner. This led medical and surgical teams to view some of the admissions pejoratively as weak or dumps. Many of these admissions were discharged as soon as possible - partly due to circumstances and partly self-fulfilling prophecy. The treatment setting mismatches in these case could occur in both the ED and the hospital if the patient did not need to be there. These problems has bee addressed over the part 15 years with the advent of hospitalists. Hospitalists have a more enduring relationship with their colleagues in the ED. There is more consensus on admissions and hospitals are staffed 24/7 by hospitalists rather than trainees. That does not mean that the treatment setting mismatch has been solved. You start to notice the issues involved with treatment setting mismatches after you are practicing medicine and you are no longer a trainee. A few examples will illustrate this point. A 75 year old woman with diabetes mellitus Type 2, hypertension, and new onset atrial fibrillation is discharged home after two days in the hospital. She came in taking 5 medications but is leaving with 8. She lives alone and during the nursing review at the time of discharge she knows how to set up the medications out of the bottles every day and the basics of what she needs to avoid in her diet. There are some red flags with her medications in terms of potential interactions and symptoms that she needs to quickly report to her physician. She currently has no primary care physician. Her physician quit the practice and moved to a different clinic. She tried making appointments with the other physicians in the clinic and had the feeling that "none of them like old people". She is discharged with a bundle of medication side effect sheets highlighted by the nursing staff. She is advised to review the highlights and report those symptoms to the clinic. An 82 year old man with dementia and agitation is admitted to an acute care psychiatric unit. He comes in with the message that his current facility will not take him back because he is too aggressive. The initial assessment shows that he is barely mobile due to osteoarthritis but that he requires intensive nursing care for diabetes mellitus Type 2, wound care for foot ulcers, nebulizer treatments for asthma/COPD, and careful attention to his input and output each day because of moderate renal failure and a tendency to take inadequate amounts of fluids. After two weeks of working with medical consultants, the attending psychiatrist realizes that there is no Skilled Nursing Facilities where the patient will get the level of care he is currently getting. Without that level of care the patient will be dead in a few months. Patient X is a 50 year old man with alcoholism, alcoholic liver disease, and mild emphysema. For the past three months he has been drinking 750 ml of vodka per day. After an intervention with his friends and family he was referred to a substance use treatment facility. The family was told at that time that he should be admitted to a detox facility because detox was not available at the treatment facility. The patient decided to go to the ED. He was given IV fluids and discharged 3 hours later with a prescription for lorazepam and told to go home and detoxify himself of go directly to the treatment setting. He took all of the lorazepam on the first day and resumed drinking vodka. He tried to get in to the original treatment facility and was turned down again because he still needed detox. The patient is at a local drug and alcohol treatment facility when he experiences a sudden acute mental status change. He is confused and starts to experience auditory hallucinations part way through a detoxification protocol. He asks to leave the treatment facility. The facility and the patient's family convince him to go to the ED. While there the staff treat him with benzodiazepines and IV fluids and tell him to return to treatment. He tries that but the treatment facility disagrees with the ED and see his mental status and being too compromised to participate in treat. He goes home and resumes drinking instead. Patient Y a 29 year old man is detained by the police in a local shopping mall for creating a public disturbance. He was panhandling. When none of the shoppers responded favorably he got very close to them and made loud threatening noises until the police were called. When the police asked him to leave the mall, he shouted at them and threatened to kill them. He was arrested but because the police suspected a mental illness he was taken to the emergency department for evaluation. The arresting officers were hoping he would be admitted for further observation and treatment. After the ED evaluation was completed as social worker came out and asked about what would happened if the patient was discharged to the street. The officers responded that he would be arrested and taken to the local county jail. At that point the patient was released on the basis that he was not dangerous and transported to county jail. These scenarios are all hypotheticals based on my experience. Any physician with similar experience can cite hundreds of these examples and many, many catastrophic endings. The common biases are that alcohol is not that much of a problem and that most people with chronic mental health and medical problems can continue to plug along with minimal assistance. The error is to ignore the real dangers and not be focused on quality care that by definition solves and addresses clear health problems. These scenarios all have some common dimensions. First, the receiving setting is easily exceeded by the patient's medical needs. In some cases the receiving setting is not medical oriented at all and is ill equipped to address medical problems. Obvious examples are people who are discharged to jail or care facilities that are funded on the basis that they provide little to no medical care. The scenario where the man with chronic (or in some cases acute) mental illness being sent to jail rather than hospitalized for effective treatment is one of the reasons why county jails have become the largest psychiatric hospitals in the USA. It is one thing to recognize that fact but it is another to think about how that is happening. In most cases hospitals have little to no bed capacity for psychiatric patients. If they do - they are inadequately funded to provide complex care with inadequate staffing, length of stay, and in some cases inadequate medical and psychiatric coverage. At some point the politicians and bureaucrats decided to align the incentives so that level of care would be best provided in jail. Second, the discharge to inadequate facilities are driven by rationing of acute care facilities as "expensive and possibly unnecessary facilities". That determination is complicated by the fact that receiving facilities have also been depleted by the same rationing mechanisms. The reality of American healthcare at this point is that it is almost all rationed by a middleman who are incentivized to make as much profit as possible by rationing. A great example is detoxification from drugs and alcohol. 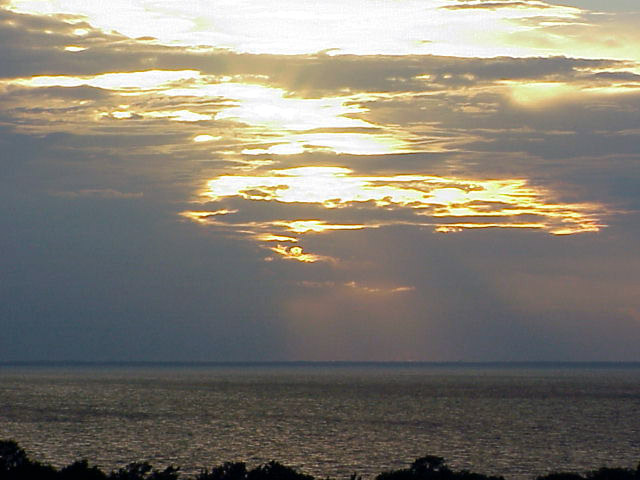 Despite the fact that this process is potentially life threatening, at the minimum is associated with a high degree of distress, has significant psychiatric morbidity including suicide risk, and needs to be properly done in order to facilitate sobriety very few people in the USA are admitted for appropriate detoxification. Like people with severe mental illnesses they are mostly sent home or to a facility with minimal to no medical coverage and then sent home. In cases where a person is incarcerated they often go through acute detoxification with no medical assistance. In many cases they suddenly stop opioids, benzodiazepines, or opioid agonist treatment (methadone or buprenorphine) and go through severe withdrawal in jail. Third, leaving a medical facility where there is intensive nursing care is like falling off a cliff for a lot of people. There is no transition or assurance that many people can manage their own care in their own homes. There used to be more options. Public health nursing comes to mind. Twenty years ago the attending physician could write an order and a public health nurse would see the patient in their own home and make sure that the transition was occurring properly and if not stay in contact with the patient and provide ongoing assistance. That service was eliminated along time ago in order to reduce costs. Fourth, an entire system of shadow care has evolved to make it seem like care is being provided when it is not. Typical examples include health club discounts or a life style coach that calls you up on the phone and encourages you to be more physically active or eat less. The ultimate advertising these days is a plan where you get a very modest health insurance discount through your employer if you sign up for one of these options and demonstrate compliance. It makes it seem like both your employer and your health plan care about your health. In the larger scope of things, it is nothing compared to the lack of care that happens in the above scenarios. The final point to be made here is the irony of spending more money on health care than any other country in the world and having a large portion of it go up in smoke. The source of that smoke is the huge administrative costs and profits of rationing health care under the guise that it is more "cost effective" or "efficient". There is nothing cost effective or efficient about rationing poor quality care to patients. The best evidence is during care transitions and the resulting treatment setting mismatches. I first read about the Interpersonal Psychotherapy of Depression when the book came out in 1984. The origins were there for quite a while before the book. Gerald Klerman, MD and Myrna Weissman, PhD were prominent in developing a model that depended heavily on psychoanalysis and previous interpersonal theorists like Harry Stack Sullivan and John Bowlby. The theory rests on a fairly basic assumption and that is that depressions can have an interpersonal etiology as well as social and biological ones. At the time the book came out, manualized psychotherapies were starting to peak. A few years earlier I requested a copy of the research manual from Marsha Linehan, PhD and she sent it to me. That original manual is quite different from the way that (dialectical behavior therapy) DBT is practiced today as a general group behavior therapy. Beck, Ellis, and Meichenbaum were focused on cognitive-behavioral therapy or CBT at about the same time. These authors produced texts and manuals on how to perform these therapies. The driving force for the manuals was psychotherapy research. A standard research protocol in any therapy was to produce a manualized version, train the research therapists in the therapy, and then monitor them at various points in the therapy to assure that they were performing the therapy according to the manual. Clinical training at the time was not nearly as standardized. It is fair to say that the predominate training model for psychiatrists was psychoanalytically based psychodynamic psychotherapy. The main subdivisions were insight oriented psychodynamic psychotherapy and supportive psychotherapy. Supportive psychotherapy avoided confrontation of the patient's defenses and the therapist used many of the techniques used in CBT. There were also some brief forms of psychodynamically based psychotherapy. Viedermann wrote about a psychodynamic life narrative model of crisis intervention for college students in crisis. It was designed to be delivered in just a few sessions. The approach was interesting because it had interpersonal psychodynamic interpretations rather than transference based or interpretations based on unconscious mechanisms. Depression is a very heterogeneous category of disorders. The interpersonal context remains the same and it is up to the clinician to figure out what might be relevant - what might have personal meaning. The four areas of focus noted int he above diagram can be historically recorded in just about anyone's life - but are they the cause of depression? IPT answers the second half of that question - what can be done about it? A good illustration is the case of the depressed person who has sustained a significant personal loss that they have not recovered from. In clinical practice it is common to see people who are depressed and date the onset of that depression to a point in time when a significant figure in their life died. Whether that happened 10 or 20 years ago - they have not recovered despite antidepressant maintenance or multiple antidepressant trials. 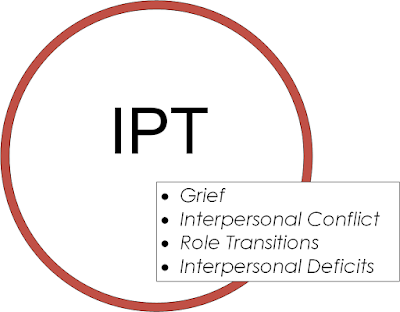 The goal for the IPT therapist is to discover of the depression is due to the loss of the meaning of the loss and facilitate completing the grief process. In today's world, many patients with grief are referred to Eye Movement Desensitization and Reprocessing (EMDR) therapists for presumptive post traumatic stress disorder (PTSD). I have certainly encountered people who were traumatized by the manner in which their significant other died. The most common scenario is a surviving spouse or parent. In the majority of cases, the patient is experiencing grief and they have not been able to complete that process. The IPT therapist is able to recognize and treat that problem. "Although Klerman, a psychiatrist, saw depression as basically a biological illness, he was impressed by how social and interpersonal stress exacerbated onset and relapse. Noting that ‘one of the great features of the brain is that it responds to its environment’, he felt that the interpersonal context of the onset of a depressive episode might be a target for psychotherapy." I would add that at the time there was active conflict between academic psychiatrists who considered themselves to be biological psychiatrists and a group who considered themselves to be psychotherapists. Eclectic psychiatrists like Klerman existed in every department but they tended to be the silent majority. Psychiatrists like me were fortunate to be trained by them. There have certainly been other manualized versions of psychodynamically based psychotherapy. The authors here have really streamlined the process and generally provide a level of analysis based on social roles/behaviors and discuss specific strategies to address problems. When it comes to assessment and diagnosis - I have a lot of details on this blog supporting the basic framework that a psychiatric diagnosis is really not enough when it comes to a psychiatric assessment. There needs to be an overall formulation of what the patient's problems are and how they came about. A diagnosis or diagnostic code is a poor substitute. Considering two 50 year old men with severe depression - it probably matters if one of them got depressed as a result of being fired and the other became spontaneously depressed and could not work because of that disability. That fact alone creates more relevant information for the diagnosis and treatment planning that all of the diagnostic codes and modifiers. Once the formulation is in your notes, you can pull it up at subsequent visits and discuss what is relevant to the patient. Many of the interventions are very focused and can be discussed over the span of 15 or 20 minutes. Instead of just reviewing medication related symptoms and side effects, the discussion can include a therapy that is effective for depression and may either enhance or replace the medication effects. I have had people ask me at the end of the interview to "Tell me what you think the problem is." They may add other sentences for emphasis like: "I've done all of the talking here - you're the doctor - tell me what the problem is." Listening for a thread in addition to the usual description of symptoms allows for a formulation based on interpersonal of social contexts and how that relates to diagnosis and treatment. It should not be too hard to believe that most people find that a DSM atheoretical formulation falls flat. If the IPT therapist is talking with a patient who dates their depression back to the loss of someone who they were emotionally attached to and that has never been addressed, that provides some diagnostic and therapeutic insight in the same session. In some cases it can also lead to cost effective therapy for the patient if there are grief counseling clinics or a clergy person who does grief counseling. One of the glaring errors I have noticed with a lot of current therapy is that it is trauma based. To me that means that a person has experienced trauma at the level that it could cause post traumatic stress disorder or similar problems. I see many people with grief diagnosed as having a trauma disorder and treated with exposure therapy for grief. 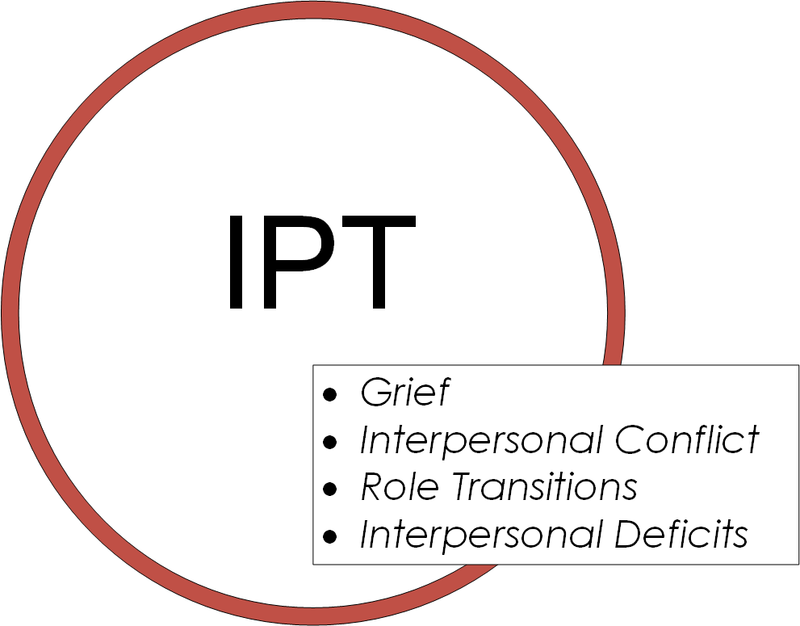 Grief counseling or an IPT approach is a preferable option. The term psychopharmacologist is often mentioned by people who I assess. I ask myself what does a psychopharmacologist do when the patient is experiencing a chronic stressor that is either environmental of interpersonal in nature. Does the medication just go up to the point that the person is numb to the stress? As a psychopharmacologist myself, there is an obligation to let people know that at some point - the stressors in life will overcome the effects of medicine and that there is no medicine that will overcome chronic stress - at least without sedating them to the point that it will be difficult to function. At that point the therapeutic alliance needs to focus on resolving the environmental or interpersonal stress. It is extremely important at that point in time to be able to associate the patients problem with the therapy models and discuss these paradigms as a way to resolve the problem. In this case - hopefully all psychiatrists have been trained in the non-medicine dimension before they start seeing patients. Those are some of my thoughts about IPT. I have always considered it to be an effective and pragmatic form of psychotherapy. Back when I was learning about psychotherapy, I had supervisors of every stripe ranging from Rogerian therapy to psychodynamic to existential psychotherapy. The paradoxical aspect of my psychotherapy supervision was that they all advocated for picking one style of therapy and sticking to it. I really don't think that is a good idea. Strictly in terms of psychodynamic therapy, one of the key aspects of the assessment was to determine if the patient was psychologically minded enough to engage in the constant clarification, confrontation, and interpretation that goes on in that format. If not they were considered candidates for supportive psychotherapy. To someone trained in my era, CBT, IPT, and DBT and their equivalents would all be considered supportive psychotherapies. I think that provides a good rationale for knowing these therapies and being able to apply them to situations where they might be the best approach. 1: Viederman M. The Psychodynamic Life Narrative. Psychiatry. 1983 Aug;46(3):236-246. PubMed PMID: 27719516. 2: Klerman GL, Weissman MM, Rounsaville BJ, Chevron ES. Interpersonal Psychotherapy of Depression. Basic Books, Inc; New York; 1984: 255 pp. 3: Markowitz JC, Weissman MM. Interpersonal psychotherapy: past, present and future. Clin Psychol Psychother. 2012 Mar-Apr;19(2):99-105. doi: 10.1002/cpp.1774. Epub 2012 Feb 14. PubMed PMID: 22331561. I posted on the therapeutic alliance about 5 years ago. The goal of that post was to point out how psychiatric treatment occurs - specifically the idea that the physician and the patient need to collaborate and define a set of diagnoses and/or problems to work on. They have to agree on the problems and also the plans to resolve (or not) resolve them. In the case of a chronic illness with no clear resolution, the goals are focused on optimizing function. 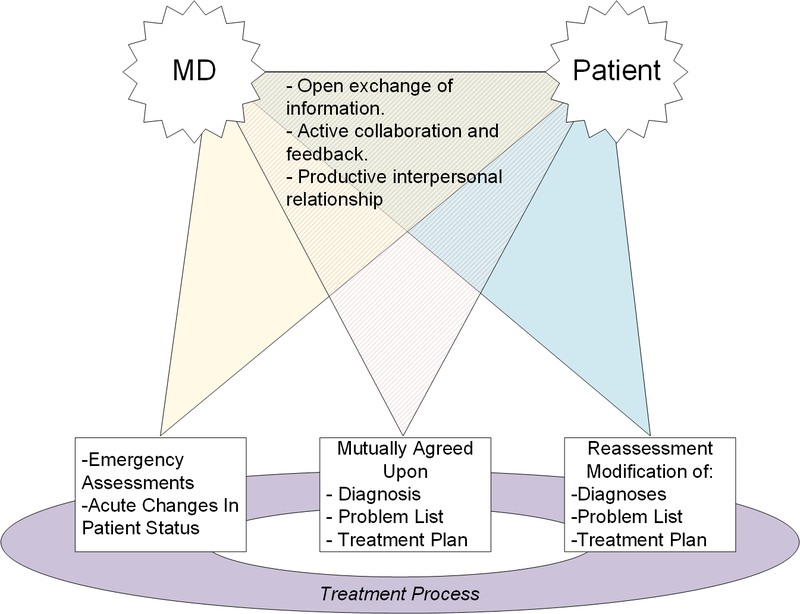 The is basically the ideal treatment model for any physician and any treatment - the only difference is that psychiatrists are trained to attend to the relationship between the patient and the physician in very specific ways. That includes the concept of transference and countertransference or the emotional reaction and associated thoughts of the patient to the physician and and the physician to the patient based on their past experiences. By attending to those patterns psychiatrists can develop insights into what is unfolding in the relationship and in some cases use defensive patterns to assist in the diagnosis and treatment process. I had a few ideas about how I wanted this diagram to differ from the diagram in my previous post. First, I wanted it to reflect treatment continuity. Ongoing treatment is a dynamic process of multiple events across time in the case of ongoing care. It can also involve single cross sectional interventions that require a patient to complete a prescribed treatment and contact the physician if the problem is not resolved as expected. There are several hard stops to a medical treatment process - cure, improved function without cure, increasing disability, care refusal, and death to name a few. I decided to leave those implicit and not alter the basic diagram. Second, I thought that triangles demarcating the physician-patient decision space would be a good idea because they are more open structures and were used in a recent example of how graph theory may be useful in neuroscience. Third, I wanted to avoid jargon. There are numerous conceptualizations of the conscious state of the patient and the physician and what that implies for the communication - but I distilled it down to the communication and collaboration parameters as noted above. There is implicit informed consent in this model. There are far too may people who see physicians and adopt a passive role. In some cases they request that the physician make important decisions for them: "What would you do if you were me?" The role of the physician is to communicate the information that the patient acts on with all of the attendant risks. The general model is a good one for all medical specialties. Psychiatrists are be trained to attend more the the relationship and overcome obstacles to treatment. A basic example would be the person who consults with a physician but who is skeptical of the physician's motivations or intentions. In many cases this results in a disagreement and the relationship is terminated without the patient receiving treatment. A psychiatrist should be capable of recognizing what is occurring in the interview and at least being able to point out the reality of the situation to the patient. That reality is depicted in the diagram at the top. I frequently tell people that I have no interest in telling them what to do or even prescribing a medication that they do not want to take. My appropriate role in the model is to give them the best possible medical advice about resolving problems the we both agree on and that might benefit from treatment. It is their role to decide among the options and consent to treatment. Not consenting to any treatment is always an option. The model also implies that both parties are competent to interact and make decisions. In the case of physicians, states have a vetting and licensing process that is focused on public safety and it does a good job of removing most unsafe or incompetent physicians. In the case of the patient, there are various contexts in which substitute decision-makers are engaged in the process including guardians, conservators, and judges. The legal process to make that determination varies widely from state-to-state and even county-to-county within the same state. Medication reconciliation has become a term that is much en vogue after the Joint Commission and electronic health record (EHR) manufacturers got a hold of it. Medication reconciliation (MR) basically means that anytime a patient changes health care setting there needs to be a procedure in place to assure that their medications are not changed as a result of that transition - no medication errors can be made. The best example is a patient goes from an outpatient setting into a hospital for surgery, has the procedure done and is discharged. This care transitions would require a medication reconciliation at the time of admission and another one at the time of discharge. Prior to the EHR, a physician would just transcribe the admission orders rewriting or modifying the patient's outpatient medication as necessary. With the EHR, the MR can be rapid if the patient and the medication are already in the system, or it can be a very slow process if they have to all be entered from scratch. In my 22 years of inpatient experience, I have a lot of experience with this process. I would be the recipient of shopping bags full of medications and learn that some patients were taking greater than 20 medications at a time. Most of my time on inpatient units, I was in charge of reconciling all of the patient medications - medical and psychiatric on the patients I admitted and discharged. In extreme cases this process alone could take an hour on either end. It got a lot worse over time because more people were inserting themselves in the process. Pharmaceutical benefit managers learned to demand an entirely new prior authorization process, even for medications that the patient had been taking for years - at the time of discharge. 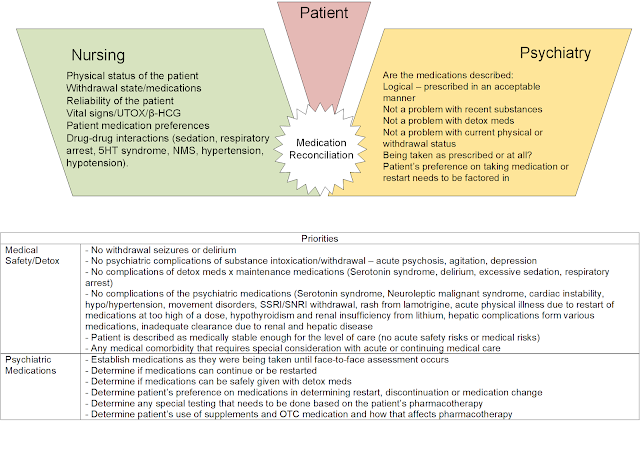 The reconciliation process has several modifications based on the care model. For example, in less acute care settings where physicians are not present in the facility at all hours, on-call staff call in and do remote medication reconciliation. Before the EHR that would involve a discussion with nursing staff who would review the medication, the patient's status and put in the orders. The physician would countersign these orders the next day. In current EHRs, there is a med reconciliation section and there may be an expectation that the reconciliation occurs at the time of admission. Nursing staff will typically enter the medications from available bottles or pharmacy records. The physician has to pull up the record remotely, review the patient's status with nursing staff, and sign off on the entered medications. In some systems, only the basic prescription is ordered and the physician will have to complete numerous fields before the inpatient orders are complete. Modern EHRs invariably include drug interaction software with very low thresholds and all of those warnings need to be clicked through and dismissed before the patient's usual medications can be resumed. It is a very slow and inefficient process compared to before the EHR. One of the rationalizations for the MR in the EHR is patient safety. Regulatory bodies like the Joint Commission are very big on safety factors and they should be. The EHR was supposed to greatly reduce errors due to illegible written orders, but in this case the physician was giving verbal orders to nursing staff. A quick glance at the graphic at the top of the page illustrates some of the thought and decision making that needs to go into this process. There is really no known way to make it fool proof. Subjective determinations about medications and medication safety are being made at every step of the way. Errors in MR still occur largely because of the assessment required by nursing and in this case psychiatry. The easiest way to conceptualize this is to think about people who take prescriptions and whether they take the medication exactly as it is prescribed on the label. The commonest problems involve patients taking their medications at the wrong time or all at once. Often they have been advised by their physician to make a change but the prescription has never changed. In many cases they have stopped the medication and want to restart it. The prescribing physician may not know that the patient is using alcohol, other substances, or nutritional supplements with the prescription. Continuing medications, stopping them or modifying them requires significant clinical judgment and there may be a lot of uncertainty about the history obtained. Medication reconciliation is a complex and potentially lengthy task. It works best with experienced nursing staff who can get the best information to the prescribing physicians and then physicians who have good clinical judgment and flexibility to adapt to changing histories. It is a potential area for artificial intelligence applications. AI could assist nursing staff without replacing them. We need an optimal algorithm and a full description of the decision space associated with this process. Most importantly we need computer applications that support staff rather than getting in their way and requiring staff support of their own. One of the most interesting aspects of the current conceptualization of medication reconciliation is how it is perceived by administrators and regulators. The idea that medications can be entered into a piece of software that is essentially a word processor and that makes things right is almost magical thinking to me. All of the hard work leading to that conclusion (see graphic and beyond) is not only ignored - but nobody seems to get credit for it. It is the old rationalization: "If it isn't documented it didn't happen." This is clear proof that most of what happened isn't documented. If would be impossible to function if it was. At some level it appears that all of this hard work was produced by the EHR and not physicians and nurses. Credit to the geniuses who came up with the software and the administrators who decided to put it in. How did we ever practice medicine without them? We end up documenting what we are told to document and it is a poor substitute for what actually happened. Some of the underlying reasons for that documentation are almost always political. I posted on obstructive sleep apnea (OSA) and continuous positive airway pressure (CPAP) last year and it was well received. Since then I have given out a lot of advice on CPAP based on that post and in general to people I have consulted with. I continue to encounter all of the problems that I mentioned in the original post. The message that I am continuing to give people is that they cannot view CPAP as an option. It may not seem like it but it is a critical intervention to prevent the cardiac and metabolic complications of obstructive sleep apnea. There are several of them and they are severe and potentially life shortening. Anyone with this diagnosis owes it to themselves and their family to make CPAP work to avoid the morbidity and mortality associated with OSA. It is very common in my practice to do my standard sleep assessment and hear that a person was diagnosed in a sleep study and that CPAP was recommended but for various reasons they are not using the machine. I frequently hear about how the patient just "throws it off in the middle of the night" and how they "can't stand to have anything on my face" even in the case where they were diagnosed with severe sleep apnea. Comments like those seem to understate the seriousness of the problem. In many cases, insurance companies have asked for the machine back because the record on the SD card in the machine shows that it is not being used. A person sitting in front of me with untreated OSA is complicated because their physical health is compromised and the immediate complications of untreated apnea and hypertension also compromises their psychiatric care. The OSA and daytime somnolence becomes insomnia and that person may expect medical treatment for insomnia. The prescription of sedating drugs is actually not a good idea for people with sleep disordered breathing. The same think is true for hypertension. There are several medications that can make hypertension worse and that I would not prescribe to people with uncontrolled hypertension. Despite those qualifiers - I see medication and doses that I would not prescribe being given to people with untreated OSA. It is untreated largely because the person does not give CPAP a chance. Here are a few tips that I give people that they have found to work. I am not working in a sleep lab or clinic so I am seeing them after the study has been does and after they have seen a wide range to technicians who were supposed to help them with mask fit and instructions on how to use the machine. A lot of people try the full face mask and throw it off repeatedly at night and decide that's it. If feeling confined by a mask is a problem there are smaller modified masks and nasal CPAP. Try several until you find the one that works the best. It is surprising how many people think that they will save time by not using the humidification system with the machine. Not using the humidification is another sure way to not tolerate CPAP. Maintain and adjust the humidification for maximum comfort as you are adjusting to CPAP. In order for CPAP to work there has to be air pressure transmitted into the upper airway to maintain a splinting effect and prevent obstruction. Air leaks put that pressure at risk and can prevent the effective use of CPAP. Trying to find air leaks can be frustrating because after the fitting occurs by the technician or respiratory therapist there are problems at home associated with sleep positions. With the wide array of equipment available it is very unlikely that you will not be able to find a device that works, but in some cases it may take a while. 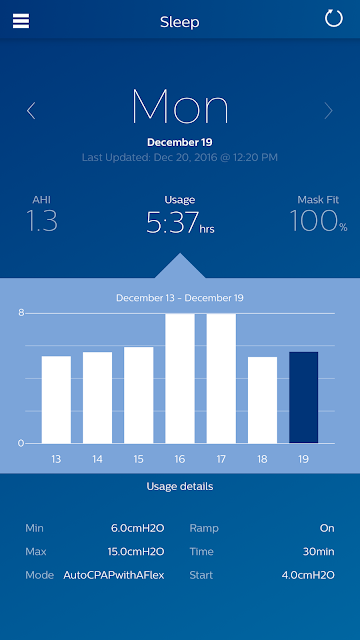 An APAP device with a readout each morning (see graphic) will tell you if there have been any significant air leaks (100% mask fit = no air leaks). APAP is an abbreviation for Automatic Positive Airway Pressure. This machine is able to sense increasing obstruction and adjust the pressure. One of the main advantages is that a lower baseline pressure can be used and then as any obstruction occurs the devices increases the pressure to overcome it. Standard CPAP devices have the pressure set based on the original sleep study. In the case of significant obstruction that could mean a constant high pressure. Constant high pressures can lead to some side effects such as ear pain from pressure effects. The really strong point of APAP devices is that they are generally much more sophisticated pieces of equipment. They can make the data available over the Internet to a sleep medicine physician who can remotely adjust the settings based on downloaded data. They also allow the patient to download their data each morning via a smartphone app (see the above graphic) so they know the hours that they wore the device each night, what the pressure settings were, and how many apneic/hypopneic episodes occurred (AHI or Apnea/Hypopnea Index) per hour. The modern APAP allows the individual patient unprecedented control over the treatment of sleep apnea. With the feedback every morning they can be assured the device is working. In the previous example, I showed a patient with increasing upper airway obstruction who eventually had some episodes of atrial fibrillation. He had no idea that his system had airleaks and his AHI was increasing until he developed the atrial fibrillation. With a new APAP system he would have had immediate feedback on day 1. Sleep positions can also lead to better APAP/CPAP performance. With the APAP device, feedback will be there within a few days if side sleeping is better (lower AHI) than back sleeping. Looking at the readout of an AHI of 1.3 from Monday in the above example, this patient determined that by sleeping on his side he had consistently fewer episodes that if he slept on his back where his AHIs were all in the 3-5 range. The final advantage of knowing that there is an APAP device out there allows the patient to advocate form themselves. I don't know if it is widely known but there are clearly some health plans who only provide CPAP devices to patients diagnosed with OSA. APAP devices are more expensive and based on what I have written it is clear that they are superior devices. I updated this post to include a comment on oral appliances (OA) for CPAP based on a question that I received. I commonly see people who dislike CPAP and use the OA instead. They claim that is "works better" than CPAP but I doubt it. It does improve snoring and can reduce the AHI based on that improvement. The problem is the improvement in AHI is generally not nearly enough to be considered an adequate level of treatment (AHI < 5) (1). For that reason, expert guidelines recommend the OA for snoring alone or OSA in the case that the patient is intolerant of CPAP(2). Advertisements for a dental approach to OSA are commonplace and usually cite the years of experience of the clinician as being the determining factor. I would recommend considering a sleep study with the OA in place to see just how much the AHI had improved. In the case of the APAP machine you can read the number off your smartphone app every morning. Use those numbers to determine the best treatment for your condition. If you have been newly diagnosed with OSA and prescribed CPAP - be sure that you get a complete discussion of CPAP versus APAP and why your doctor is recommending one over the other. Ask your sleep medicine physician the ideal solution rather than what your insurance company covers. If cost is the only limiting factor - used and resanitized equipment may be an option. The treatment of OSA with CPAP/APAP has never been better. Make sure that you get a machine and a system that you are comfortable with and that works. APAP devices can give you consistent feedback that is easily accessible. There are some ways that you can hack a CPAP device and read the information on the SD card, but it is much easier to pull up the data with an app. The immediate daily feedback that you have a working device and the lowest possible AHI is strong reinforcement to keep using it. 1: Van Haesendonck G, Dieltjens M, Hamans E, Braem MJ, Vanderveken OM. Treatmentefficacy of a titratable oral appliance in obstructive sleep apnea patients: a prospective clinical trial. B-ENT. 2016; 12 (1): 1-8. PubMed PMID: 27097387. "CPAP is superior to OAs in the measured outcomes and, therefore, should be the first-line option for treating OSA"
I am not a sleep medicine physician and do not prescribe these devices. The information posted here is based on my experience doing sleep assessments as part of the standard psychiatric evaluation, referring patients for polysomnography, and getting the results of those tests during the treatment of my patients. In follow up, I have to assist people in the proper use of the equipment and the pitfalls they encounter trying to establish a routine to use CPAP. I have no competing financial interests of any kind. The graphic at the top of this post is from the smartphone app that is used to download (via Bluetooth) all of the data on the screen each morning. It keeps a running bar graphic and rolling over that graphic gives the data for each day. The data is assembled by a remote server through a wireless connection each day and the patient's sleep medicine doctor can monitor this data and set the machine remotely without needing to visit that physicians office. Since my Labor Day message to colleagues dovetails so well with these editorials, I did not want to miss the opportunity to comment on them. They appear to be written by people with policy interests in this information technology takeover of clinical medicine. They are mildly critical but totally miss the mark on what a catastrophe this government roll out has been. The question any taxpayer should ask is why any other outcome would be expected. Software and network implementations world wide and at the level of the US government have led to colossal failures. Multibillion dollar investments that at some point were abandoned. The only difference in this case is that the government is not the actual client. The federal approach to health care - apart from the brief foray of FBI agents raiding physicians offices to see if they made any coding violations is to set up payments for proxies and let them hash things out with providers. The primitive approach of marginal incentives that are really weighted as penalties is supposed to facilitate the whole mess. The mess would get implemented either way if you ask me. There are tens of thousands of executive and mid level health care executives chomping at the bit for a project like this to mismanage. And they have mismanaged it well. Government leverage makes it difficult to refuse. The initial editorial by Washington and co-authors (1) focuses on the success of getting hospitals and physicians on the electronic health record (EHR). They present a graphic showing the steep increase in EHR use over the 2004 to 2015 decade. The acute care hospital curve ends at essentially 98-100% for certified EHRs and office based practices are at 90%. The article rightly points out that physicians have borne the brunt of the implementation and how physicians are frustrated by the lack of "actionable information generated by these systems". The article discusses the need for the "seamless flow of electronic information" in a couple of places. It describes how EHR could be useful in research. It ends on a vague note that there is still a lot of work to be done and maybe that will happen some day. "Soon physicians were expected to provide high-quality and empathic care in a 12-minute visit while weaning themselves from paper-based workflows, entering the numerous structured data elements required for meaningful use, rolling out new HIPAA privacy notices, implementing security protections for new electronic data, learning and incorporating new ICD-10 billing codes, and convincing their patients to use patient portals and secure e-mail, all while avoiding safety and malpractice issues." (p 907). At one point they make the argument that health care organization have moved to "value-based purchasing". Was that applied to the EHR? Is there anyone today who would suggest that any EHR that is currently sold in this country is a value based proposition or is there as a result of HITECH legislation? In their conclusion they suggest that now all of these systems are installed - the government can afford to pull back simplify requirements and let market effects shape some of the metrics like interoperability. They suggest that returning control to the customers is a path to "recapturing the hearts and minds of our clinicians." Enterprise wide systems are incredibly expensive both upfront and for the annual licensing and maintenance fees. That does not include any modification of the system - that will typically cost more. Once a health system has bought in - it is difficult to shop around and come up with a better deal. In some areas one company has a monopoly on the enterprise. In many cases the systems are marketed as being a lot more easy to use than they are. Support is huge in the implementation phases and drops off in a hurry. Subsequent modifications - even if they are easy to make cost large sums of money. In some cases the vendors demonstrate whiz bang technology like seamless integration with voice recognition systems. The customers often find out that those options don't work well with their systems or are available as a high priced option. In many organizations the EHR budget (combined with other federal costs cutting measures) is a fixed drain on the budget. If revenues fall, lay offs can occur just to keep the EHR running. In private practices, the up front and monthly licensing fees are no less of a burden. There are some "free" EHRs that are funded by advertising or research but no standard comparison or guidance for any clinic that needs to implement one. The total budget of these costs would be interesting to see, but I have never been able to find a good reference. Health systems typically describe their margins in the low single digits. If that is true and EHR system costing tens of millions up front with tens of millions in maintenance costs is clearly a tremendous drain on the system. I don't know what percentage of physicians has seen their EHR rolled out in a way that does not optimize clinical utility. Working physicians need the most rapid route to incorporate the EHR into their work flow. That includes software that works, software that is efficient, and ideally software that is smart enough to allow individual physicians to analyze trends in the same patient or groups of patients that will allow better diagnosis and treatment. The IT implementation is also frequently biased toward administration rather than clinicians. Many clinicians are surprised to find that someone is counting their mouse clicks as a way to measure productivity and the EHR charts they access are monitored. This is another significant cost that nobody ever seems to discuss. The most egregious implementation error is when a software change is made on the fly and the physicians are given a heads up with no training. They are expected to learn the software change with no training. I have always found the illusion of assistance with the EHR interesting. For the first few months there are always superusers and the factory reps clamoring to help you out. They gradually fade into the background and you are left with a very poor piece of software. As far as I can tell current EHR programs are designed to deliver lab and imaging data, generate documentation and reports, and perform a billing and coding function. They do a fair job with the labs and imaging details. Documentation is very labor intensive and poorly done. It adds hours per day to the physician's work flow and has necessitated the hiring of scribes and retired physicians just to keep up with the documentation tasks. It is common that EHRs cannot be accessed by outside physicians and when that happens - the printout sent to those physicians is poorly structured and extremely content poor. On the authorship side - a basic goal should be to produce a document fairly quickly that appears to have been written by an intelligent being. As anyone who has read EHR entries or reports that is not typically the case. There are extremes at either end. You can find notes that are basically a series of check boxes or you can find 18 page notes where the author imported everything that they could into the note because that is one of the few things (in some EHRs) that you can do quickly. Neither approach is helpful in terms of continuity of care or developing rational treatment for a patient. Having used EHRs for the past 15 years - I can attest to clunky editing and incompatibility with voice recognition systems as being major drawbacks. The text fields of some EHRs only work with their own microscopic and very slow editing tools. It is impossible to set a cursor anywhere in the field to produce the document. Using this twenty times a day when you are used to working with functional word processors is maddening. Some systems of care set a font that looks like it is out of the 1950s and that is how the final document appears. Every physician was appointed (under penalty of law) to be their own billing and coding specialist. Sure every hospital and clinic has some billing and coding specialists but today they are there basically to audit the work of physicians. In the EHR this translates to a tedious search for the diagnoses, listing them in the right priority, and signing off on the diagnostic and billing codes. This can take up to an additional 20 mouse clicks per encounter. Even if you can do that in 2 minutes - times 4000 encounters per year - that equals another 133 hours per year. That is work added just to maintain the EHR. Before the EHR, billing and coding could be completed in about 10% of the time. All the time physicians are engaged in these inefficient EHR based practices they are hearing how the EHR is such an advance in efficiency and productivity. Before the modern EHR, there were a limited number of workstations per hospital and most of them were shut down at night. Now there are thousands of workstations and storage arrays in large organizations running 24/7. They can't be shut off because of frequent software updates. Nursing and medical staff can easily be observed spending most of their workday at computers rather than talking with patients and families. Before the current EHR, physician would typically look at a computer screen to review the labs and possible the MAR (record of meds given). Now starting at a computer screen most of the time is the norm. The EHR dominant approach has increased the electrical bill and reduced time spent with patients at the same time. There have been well publicized leaks of large numbers of patient files and more recent ransomware attacks. Security in most software systems has historically been an afterthought. I have not seen any specific problems with EHR software but this tip sheet from CMS points out the potential complexity of the situation. The security problem is also more urgent for healthcare sites that are under more stringent privacy requirements like 42 CFR Part 2. Those are a few of my ideas about the rapid deployment of the EHR. Unlike the authors I am very skeptical of any drastic improvements on the horizon. If you can't make an EHR that will produce a coherent report with information content at least equal to an old admission or discharge note that is a major problem. If you can't produce an EHR that allows for some intelligent analysis of data without going through the entire record and reading every text note that is a major problem. Sure - access to labs is nice, but we had computer access to labs before the EHR. Patient access is also nice, but let's be honest - it is limited and doesn't address what patients really want - quality health care. About the only thing that I agree with the authors on is that the physician needs to be put back into the loop. But that hides the very basic fact that physicians were intentionally taken out of the loop thirty years ago when politicians decided that they could be replaced by managed care administrators. When you look at it from that perspective the massive problems with the current EHR - make perfect sense. 1: Washington V, DeSalvo K, Mostashari F, Blumenthal D. The HITECH Era and the Path Forward. N Engl J Med. 2017 Sep 7;377(10):904-906. doi: 10.1056/NEJMp1703370. PubMed PMID: 28877013. 2: Halamka JD, Tripathi M. The HITECH Era in Retrospect. N Engl J Med. 2017 Sep7;377(10):907-909. doi: 10.1056/NEJMp1709851. PubMed PMID: 28877012. A couple of days ago it became general knowledge that Equifax, one of the major credit reporting agencies in the US was hacked and information on up to 143 million people was exposed. To make matters worse, the theft occurred from the company's own identity theft monitoring division called TrustedID Premier. Like most identity theft prevention companies they charge a monthly fee for monitoring your credit transactions and monitor credit card transactions by number. They generally store more personal identification information than is found on a typical credit report. According to Bloomberg financial news Social Security numbers, addresses, driver’s license data, and birth dates were available to the hackers. It took a few days but the agencies eventually picked up on the fact that Equifax was going to provide a year of free credit protection in return for a waiver that the person getting the protection was not going to sue the company. The Bloomberg piece quotes an attorney saying that Equifax could be facing and $70 billion in claims and a multibillion dollar class action lawsuit has already been filed. It goes on to point out that the consumers are limited by arbitration, but in practical terms they are also limited by the sheer scope of trying to collect damages from massive corporations. I have followed consumer reporting since it all started back in the 1970s. Originally it was just one company and the data was held in a safe. With the evolution of information technology in the 21st century the landscape has evolved into three national credit reporting agencies Equifax, Experian, and TransUnion. There are longstanding concerns about the accuracy of the data they keep in credit reports, the rating system, consumer access, and dispute resolutions. The fact that all of the information is stored under Social Security Number identifiers is significant for two reasons. One is the promise that Congress made to the American people when Social Security was introduced - the the Social Security Number would never be used as a national identifier. At the most it would be used within the government for identification purposes. Today all credit reporting information is linked to SSNs and the numbers are bought and sold on the black market by the tens of millions. Reason two is that this is this wholesale loss of control over the SSN has been the single most important cause of identity theft. According to the US Department of Justice - 17.6 million people or about 7% of the US population over the age of 16 was a victim of identity theft in 2014. Although half of these incidents are rapidly resolved with minimal losses the scope of the crime results in total losses to victims of $15.4 billion. The DOJ study shows that social consequences of the theft (life stress) are a direct correlate with the length of time that it takes to resolve the incident. Commercial losses are estimated to be about twice of the loss to victims. The typical way that a victim of identity theft learns about the problem is that they are notified by a business. There is no standard protocol for dealing with the problem. A minority of people report it to the police and if they do they are likely to receive a police report number. Businesses in general were very lax in doing anything about the theft. The usual recommendation is complete the affadavit that the consumer did not take the money himself, but now hacking and identity theft is so common that the federal government has a special website to be of assistance called IdentityTheft.gov. Most Americans would find that the wholesale facilitation of identity theft would be infuriating enough on its own merit. But consider for a moment that they general processes that resulted in this problem are generally applied to any number of businesses including health care. A few of the common points are listed in the table below. The only possible difference is that data breaches of health care systems are much more common. Protected by state and federal laws and regulations? Use Social Security Numbers as unique identifiers? Legally mandated limits on privacy? Mandated use by every citizen – no opt out? Civil Liability limited by law? The parallels are uncanny and the results are the same. Large protected industries that at some level can trade in consumer privacy and generally act with impunity. Like the explicit and implicit protections against lawsuits that the credit reporting industry has - the managed care industry is protected from lawsuits by ERISA. Managed care companies themselves can essentially do what they want in terms of reimbursing doctors, paying for medications, setting rates and copays. They set their own standards and advertise these standards as quality. The real quality these businesses add is negligible to less than negligible. To get treated in these systems prospective patients need to agree to play by all of these limitations including the fact that medical and private information will be released to any payers and "protected entities", including companies that may be interested in selling the patient a product to treat one of their chronic illnesses. I never cease to be amazed at how passive Americans are when it comes to allowing elected officials to barter way their privacy rights and money to businesses. The credit reporting industry did not exist before a few entrepreneurs convinced Congress it was a good idea and and the legal and regulatory landscape was set to to favor those businesses to the point that they are essentially monopolies. With few exceptions, the consumer needs to pay for the information that they are collecting on him or her if they are interested in the reports and then again if they are making a significant financial deal. They are not allowed to opt out of a system that puts them at risk all of the time. It is easy to see how these systems engender a fatalistic and in some cases nihilistic attitude in many Americans. That is not likely to change until elected officials stop treating their citizens like they are cannon fodder for the businesses they invented in the halls of Congress. Attribution: Graphic at the top dowmloaded from Shutterstock per their standard agreement. 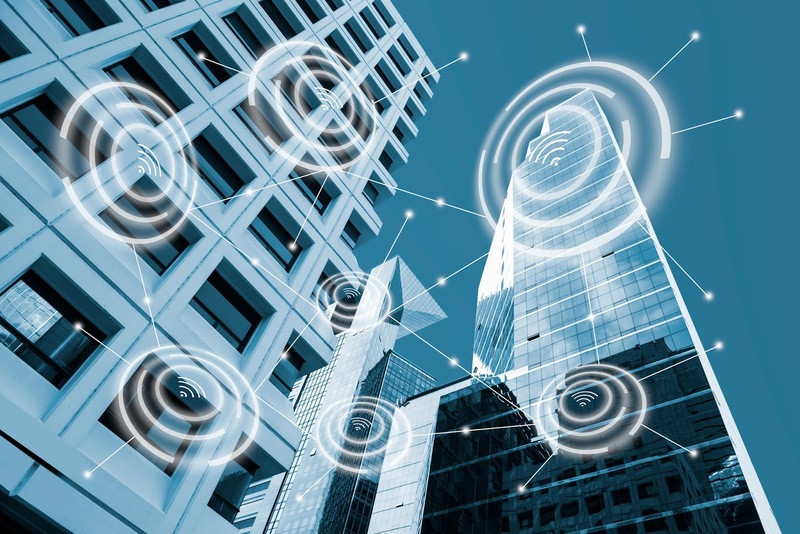 Artist is TippaPatt - labelled as: "Digital alarm icon and low angle view modern office buildings in blue tone with network connection concept, smart city and wireless communication network, IOT internet of things conceptual image." Jerri-Lynn Scofield. Wolf Richter: Worst US Consumer Data Hack Ever? Equifax Confesses. naked capitalism. September 11, 2017. "And remember: you’re not their customer; you’re their product." The inspiration for this post was a story I just read about the "victims" of the crackdown on opioids. A number of chronic pain patients were described who were only able to get pain relief from opioids. They discussed being limited to arbitrary reductions in medications or monthly limits imposed by politicians. In some cases the people taking pain medications were being treated like criminals. They don't like being treated on the basis of people who are addicted to opioids. I did a more extensive search and there are several articles out there like this. The general tone of the article is that there are tens or millions of people out there with chronic pain and that since many of them need opioids for chronic pain aren't we overdoing it a little with the restriction on opioids? Why should good people suffer just because some addicts misbehave and die? Some of these articles attempt a semblance of balance. They discuss the timeline of the opioid crisis based on policy changes and pharmaceutical marketing. They may get the opinion of some experts than generally falls along polarizing lines. In the end the reader is generally left with a definite viewpoint on what might be the right or wrong approach to chronic pain and the opioid crisis. There is never an explicit statement about right or wrong approaches being the way we got into the opioid crisis in the first place. Medicine is not a a field that you can generally approach with a pre-existing right or wrong bias - at least not for the majority of patients. Most medical care is directed at a collection heterogeneous disorders spread across the entire population. Each of these conditions has numerous etiologies and no clear cure. That means from a medical standpoint it typically takes a number of trials to see if something works. Since only a fraction of the target population responds to the intervention and a significant fraction of the target population does not tolerate it - the interventions are generally seen as being weak across the entire population. That supports odd arguments like: "Antidepressants don't work" or "Beta blockers don't work for hypertension" or "Thiazide diuretics should always be the first line medications for hypertension". It is also very tempting to look at the entire heterogeneous population and think: "Now we have a medication that can treat everybody. This is the magic bullet for this disorder". There are really very few medications that work that way. The reason for the less than robust response blockbuster drugs is quite simple - a significant number of people typically do not respond or get side effects to the point that they want to discontinue the medication. That negative response to medication is typically the main limitation when it comes to the overall effect of a medication on any population. In my experience about 1/7 people cannot tolerate an SSRI type antidepressant medication due to side effects. An addition 2/7 will not get an adequate therapeutic response. On the other hand the 4/7 of the people that respond may feel much better and notice a complete remission of depression or anxiety symptoms. Looking at the entire population the overall effect of the medication is not robust, but that does not mean that it might not be a life changing medication for some. Opioids present a much different landscape because in many people they reinforce their own use irrespective of whether the medication works or gives that person significant side effects. You read that correctly. I have had people tell me directly that they got absolutely no pain relief from an opioid but they liked taking it so much they continued to get the prescription filled. I have had people tell me that they got significant side effects from opioid medication but they kept taking it because they liked how it made them feel. Keep in mind that there is always a range of these effects but I have never heard people describe these experiences with SSRI antidepressants. The mere taking of an SSRI antidepressant does not reinforce continued use. This is the special dilemma with opioids and all medications that reinforce their own use (benzodiazepines, stimulants). When a person says that they need to keep taking that medication - what does it really mean? I will be the first to admit that they may need to take the medication and have treated chronic pain patients for years who were taking opioids. They were still in pain to some degree but they also believed the opioid was providing them with some degree of relief. The only visible sign that they could take opioids on a chronic basis was that they did not escalate the dose and did not get additional opioids or addictive drugs from other medical or non-medical sources. The obvious question in this case is "Why don't you just increase the dose of opioid to get rid of the pain?" The answer is that there is no medication - not even opioids that completely alleviate chronic pain. I have had many acute pain sufferers tell me that they did not get much relief from acute pain with opiates until the non-specific effects like sleep took over. Another factor to consider is that most chronic pain patients who come to addiction treatment centers feel markedly better and in less pain when they are tapered off opioids and placed on non-opioid medication for pain. People are often surprised to hear that, but based on what I just said it should not be that surprising. If you are taking a medication that will not completely eliminate chronic pain, has a lot of side effects, and biases you into taking it and ignoring those side effects - how can you not feel better without it? The final piece of the equation is addiction or severe opioid use disorder. At this stage - the problem is compounded by the fact that a person needs to take the medication in order to function on a day by day basis. If you happen to be a person with chronic pain - not being able to function in addition to the chronic pain puts you in an impossible situation. That is especially true if you are escalating the dose of medication in order to try to recapture the original high, cope with an emotional state, or get some sleep. In many of these situations the person will find themselves "cut off" from the clinic they attend because they have exceeded their prescribed amount of medications. Because that precipitates acute withdrawal they may seek prescription medications from a non-medical source or start using heroin. I hope that I have been able to convey the complexity of the situation with opioids for a chronic wide scale problem as opposed to other medications for similar problems. The stimulus for this post is the usual swing in journalistic opinion with complex problems. I was going to title the post: "Why journalists and politicians can't practice medicine". Complex chronic problems in medicine cannot be oversimplified into binary solutions at this point in time. Researchers are currently developing the tools that will allow us to identify subgroups in these populations and subject people to less trial and error. At some time in the next 10 years, I expect that we will be able to rapidly identify who might be able to take opioids in a non-addictive manner and who will not be able to. We might even have better medications for chronic pain that are safe and non-addictive by then. In the meantime, a rhetorical approach casting some people as victims and others as villains is unproductive and stigmatizing. As I tell my students it is the difference between drawing inferences about people in a large city based on the amount of addiction there. Twenty years ago in that large city children going to school would have to walk past three or four drug dealers. As a result urban addiction rates were much higher than rural addiction rates. Now that the rural kids have to walk past as many drug dealers, people in rural settings are addicted to heroin and dying of overdoses. Exposure to drugs rather then moral superiority is the limiting factor. To do well in medicine a physician needs to have good probabilistic thinking. A lot of that process is acquired rather than learned on a rote basis. Errors in this decision making process are almost guaranteed, but the only real problem are the physicians who seem to error all of the time. That turns out to be a minority of physicians. I expect that this group has difficulty managing both the treatment probabilities and interpersonal dynamics required to treat chronic pain, recognize addiction and implement the appropriate interventions. One thing is for sure journalists, politicians, law enforcement, and insurance companies do not do a better job than the majority of physicians. It is a major mistake to think otherwise. Graphic is supposed to indicate that only a physicians with direct responsibility to the patient can appreciate the complexity of the situation especially when it comes to the nuances of addiction and chronic pain treatment. It should be apparent that complexity can not be captured by rating scales. Eyeball graphic is from Shutterstock "Untitled" per their standard agreement. I missed my Labor Day message last year for some reason. I must have been too burned out. Burnout has been a big theme in the physician community in the last several years. It is almost like it is a new discovery or another new epidemic. Now we have detailed comparisons of degree of burnout by medical specialty and even some country to country comparisons. The curious phenomenon about burnout is how physicians are blamed for it. The typical intervention is to have a "course" on how to "handle" burnout. You know mindfulness, meditation, yoga, and time management. There is never any focus on the fact that physicians just work too hard because they have to work free for so many people. 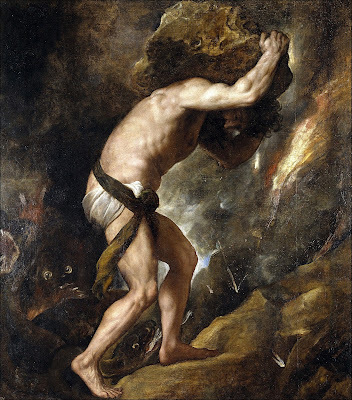 Managed care companies, pharmaceutical benefit managers, government bureaucrats at various levels, and their own employers have come to expect that American physicians have nothing better to do than devote their time and energy to the betterment of those collective businesses. By that metric physicians are the most exploited employees in the USA. There is no other group expected to work for so many businesses for free. Don't get me wrong. I am not saying that physicians are not paid well. I am saying that according to the studies I read they are being paid for anywhere between 50-75% of the time they work. Even the time that they are being paid for is deeply discounted. What other group of professionals in the USA is expected to work on an arbitrary productivity scale that varies greatly from payer to payer and has a superimposed global budget and federal incentives and penalties superimposed on top of that? Only physicians work in that environment. Only physicians are expected to teach future medical professionals for free. Another one of those cases where the the term "professionalism" can be marched out and used against you. An example: "You can just pick up this course for the medical students or residents. It should not take much time and I know you like to teach. They want you to teach." The next several weekends (whether you are on call seeing patients or not) will be devoted to to coming up with PowerPoints. Lectures and seminars in medicine these days don't happen without the ritualistic exchange of PowerPoints. In the process PowerPoints get blamed. I actually like PowerPoints if they are done correctly. I think they are unfairly blamed when the burden to suddenly produce them is displaced onto the medium rather than the process. But the focus of my missive today is not burnout or the root cause of excessive uncompensated work. It is one of the sources of uncompensated work and that the the electronic health record (EHR). The attitude toward the EHR has shifted in a direction that I have promoted for over a decade. When the group I was working for was presented with the EHR and trained on it, I knew it was a problem from the start. We were moving from a hospital wide system that was basically for entry of medication orders by health unit coordinators, vital signs, labs, and nursing notes. All of the progress notes were dictated or hand entered. At the end of the day I printed out the MAR (record of medications given) for each of my patients and double checked all of the medications they were getting. The MAR was a single page table showing all of the medications in the left margin and day columns to the right with times of administration. It was all dot matrix printing - so not as stylish as modern printouts. Back at the time when politicians were overhyping the EHR and how it would save the health care system hundreds of billions of dollars - I did a little experiment with one of my new hospital admissions. I decided to read all of the outpatient medical notes to see how many significant medical diagnoses were being carried over in the EHR. At the time we were online with the new system for about 8 years. It took me 4 hours to find and read all of the notes from Internal Medicine, Endocrinology, and Cardiology. There were 236 notes in all. But in the end I noticed that 10 significant diagnoses had been dropped somewhere along the line. Nobody ever seems to want to acknowledge the complexity in medicine. As people get older they accumulate an incredible number of medical problems and in some cases the only indication is a very long list of medications that they are taking. They have been seeing an equally long list of physicians truncating that list of diagnoses because of time constraints. In the EHR you eventually end up looking at a very short list and need to reproduce a comprehensive evaluation from scratch. So much for the time savings of the EHR. Even the politicians are quiet on that one for now. A new EHR experiment happened to me just recently. I still treat medically complex patients and often receive them from acute care hospitals where they may have been in intensive care units. Since many of them were taking various psychiatric medications, I felt obligated to see what the intensivists, cardiologists, pulmonologists, and gastroenterologists all had to say about these medications and whether they complicated critical care or ongoing care of the chronic medical problems. I want to see the results of ECGs, labs and imaging studies. I want to know if the patient received any of their usual medications when they were in the ICU or general hospital. Before there was an EHR all of this information was contained in about 10 very readable pages consisting of the admission note, discharge summary, MAR, and a couple of sheets including the actual ECG tracing and lab reports. For the event in question I read through the EHR printout. It was 48 pages long. It contained limited data. Blood pressure trends and readings were not printed even though that was one of the critical parameters being followed. The physician notes were jumbled paragraphs considerably less that traditional reports. The bulk of those notes consisted of checklists and imported data in different fonts and margins. The appearance was chaotic. Who uses 14 point Courier font in documents these days? I haven't seen that since the days of the telegraph. In that entire 48 page document there were about 6 lines in a cardiologist's note that made sense so I locked onto those for my report. I was less optimistic about Phase Two. I have been working in my current position for about 7 years and during that time I have requested MARs on hospitalized patients about 50 times. I have received exactly zero. In this case for some reason it went through. I received a 60 page fax that was the MAR. The patient was critically ill and delirious at one point, so there were five different infusions used in intensive care spread out across many of the pages. The composition of the solutions were listed and the specific rates of infusion. If I wanted to know the exact amounts that the patient received - it was up to me to figure it out. Two critical factors from the MAR that were not evident from the EHR printout. First, the patient was much more critically ill than described in the EHR printout. Second, none of the maintenance psychiatric medications were given. Total time to figure all of this out - 60 minutes. In addition to the read of the EHR printout and interview - total time for the evaluation and report was 2.5 hours. It is impossible for physicians to do a good job of patient care without all of the material I reviewed in this case. On the other hand, there are few places in the USA where the physician has 2.5 hours for each new evaluation. That is how you end up with truncated problem lists, partial medical care, and physicians staying in clinic 3 hours after everyone else has left. Without the data there is not enough information for the physician to have a decent informed consent based discussion with the patient on the new set of risks associated with a critical illness. There is no better topic to comment on this Labor Day. This is my wish to all of my colleagues trying to avoid repetitive stress injuries from the mouse clicks and typing necessary to support EHRs everywhere (I had to switch to my left hand about ten years ago).